I awoke today 30 minutes before my alarm. I think it’s because I have so much on my mind these days that it’s causing me to not sleep well. Today is my day to awaken with the boys. My husband takes the morning shift two days a week and on those days I sleep until 9am. I used to be able to sleep until noon if given the opportunity but it seems age has altered by inner alarm clock. Today I’m just going to lay with my thoughts until the alarm dings softly. It’s 7.45am and time to get my sons up and ready for the school bus. I like to wake them slowly because I used to despise having someone wake me with a bright light or loud noises, so I try to offer them a little peace when they rise. I make them breakfast of eggs and toast, pack the lunch bags (I put in a little joke or note) and fill the water bottles. I check my phone calendar to see if they need bus passes for a friend date after school and if they don’t I kiss and hug them out the door. Once I see them off I like to sit in the quiet for 10 minutes with mint tea before I get ready for my day. I like complete silence and try to clear my head. Depending on whether or not I need to leave the house for errands or if I have a class to teach affects my choice in what to wear. If I’m teaching a class I try to wear at least one thing handmade because my students love to try and guess which item I have on was hand made. I can’t work without shoes on, I feel like I’m a modern day Mr. Rogers. My work attire consists of skinny jeans, tank top with a high low tee layered over top and my grey booties. 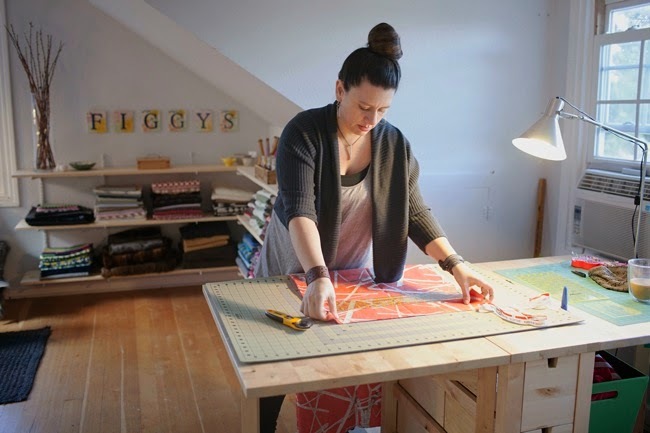 I dress a lot like how my pattern line is described: simple, modern and contemporary. My office is just two flights of stairs up so I mix my morning protein shake and head up at 9.20 am. I open email first and the responding begins. It usually take me close to 2 hours before I’m done, but on some days I find myself done in just an hour (woohoo). I have a blog post for Michael Miller due tomorrow so I need to edit photos and finish my post to mail out by the end of the day. I’ve been pretty good at doing a little here and a little there that it only takes me an hour to finish up and email. I wish the next thing on my list is sewing but I have volunteer duties at the school today working with the HOPES committee so I’m off to the school. The HOPES committee is hosting a “Sewing for Shriners” day in the school gym on March 15th. The day will include kids coming in every 1.5 hours to sew a hospital gown for a child at the hospital. We hope to have at least 100 gowns finished by the end of the day to donate to the hospital. It’s quite a lot organizing this big day but it’s very special to my heart and that makes it all better. It’s 1pm and I need to get back in the studio. Back in the studio, I’ve printed off a new pattern I’m hoping to release at the end of the blog tour in February. My graphic designer sent back my sample pattern so it’s time to sew and test. I trace, cut and sew my muslin. It’s a fairly quick sew, but after looking at the finished product I noticed some tweaking that needs to happen. For this pattern I’m working with another designer (I can’t reveal this information just yet) so I snap some phone photos and jump back on email to see if she agrees with me about the changes. Crud!! I forgot to eat lunch again. I run down to the kitchen and grab carrots, hummus and gluten free pretzels. I run into my mom and she gives me a little speech about how I need to stop skipping meals and eat some protein. I know, I know!! Did I mention my family shares a home with my parents? I call it living European style in America. With a little food in the belly, I’m back at it and it’s time to set up for class. I check my calendar to remind myself which group is coming in at 3.40pm for class. Today is Figgy’s Fashion where the kids are making garments using Figgy’s patterns. 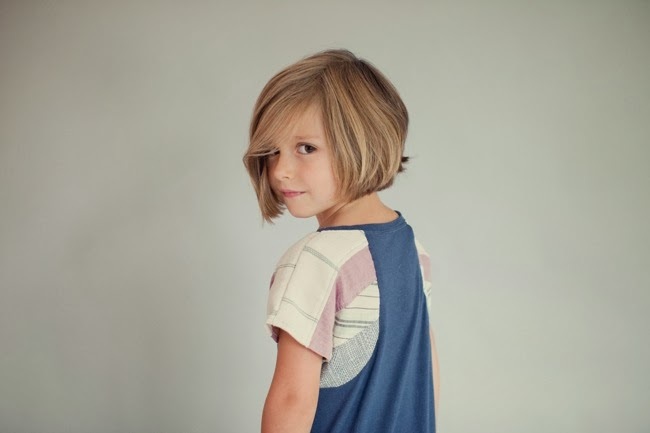 I love this class because I love to see how the kids will take the pattern and make it their own by adding something special to the garment or using a fabric I never thought to use. 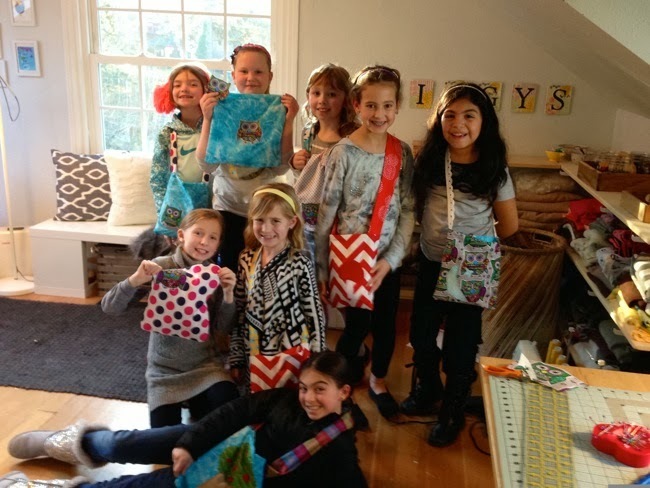 Yesterday I had a birthday party with eight girls in the studio and they all made super cute bags. It’s 3.20pm, so I pop organic popcorn in coconut oil and make sure all is ready to go. At 3.40pm, six kids have jumped off the bus and into my studio for some super fun creative time. I’m so grateful to have my mom here to greet my boys when they get off the bus and feed them a snack. My husband rolls in about 4.30pm and begins homework duty and that is a huge score for me because homework was never my favorite thing to do. 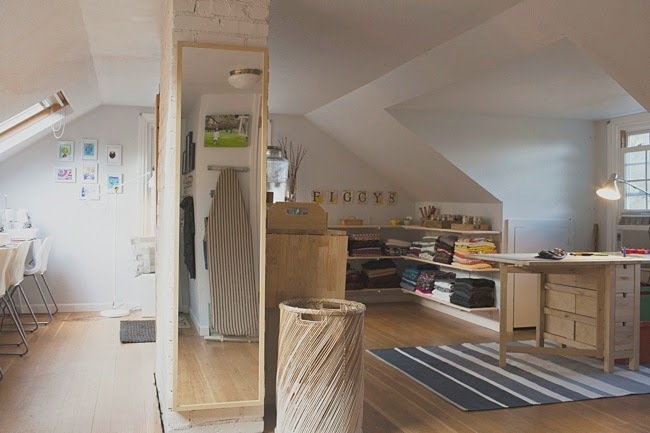 I often fantasize about opening up a storefront, but if I did that now I wouldn’t have this great home studio where my children can simply walk up a few steps if then need a minute with mom. I believe doors of opportunity open when it is time for them to open no matter how often we know or bang on the door. Having my own pattern line and teaching studio has taught me two main things: you will never be able to please everyone all the time and PATIENCE. Tonight is busy beginning after dinner. 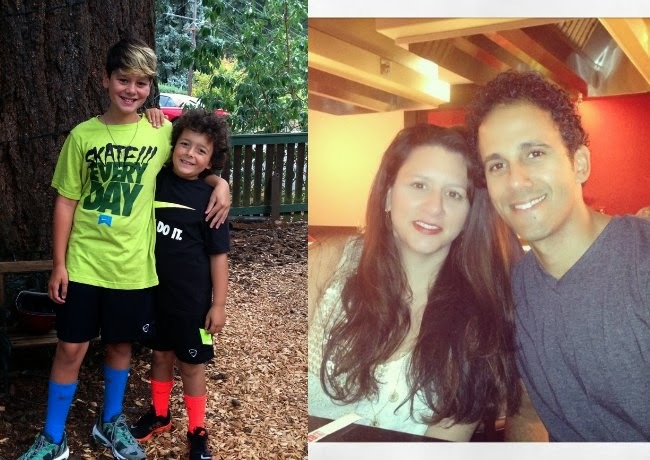 Jules has basketball practice and Franco is off to youth group so we split up and go our separate ways. Meeting back at the house by 8pm it’s time for bath and books. Reading to my children is my favorite part of the day. I get to escape with them into some fun fantasy book for at least two chapters, then prayers and lights out. I cross my fingers that I only get woken up by one of them once tonight. My husband is currently in college studying to become a paramedic, so he studies and I hit social media for work until we meet at 10pm for some husband and wife time. It’s not much these days but we’re doing the best we can as we work towards our goal of having our own home one day. I end my day usually how I begin, with a hot cup of tea and silence. By 11.30 pm I’m reading, my husband and children are all snoring and I have a little quiet time until 12am when it’s my turn for lights out. Tomorrow it all begins again where I get to create something new, volunteer at school, design and love my family as much as possible. Thanks for giving us a peek into your day, Shelly! Readers, if you have little ones to sew for, check out the new patterns from Figgy's, they are seriously cute. Want to read about more Days in the Life of inspirational people who have turned their love of stitching into a career? Spend a day in the company of Christine Haynes, Lucie Summers, Colette Patterns and more!